While it's a tad pricey for a zoom lens, the RF 24-105mm f/4L IS USM is a great performer that pairs perfectly with the EOS R. It offers the stabilisation (five stops of it) that the body lacks and the new Control ring is a revelation. The lens is relatively compact and lightweight, offers impressive sharpness and is weather sealed – in all, a great complement to Canon's new mirrorless system. 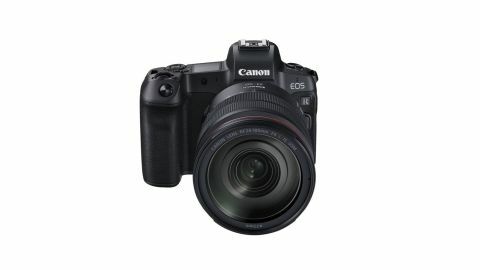 The Canon RF 24-105mm f/4L IS USM is a kit lens specifically designed to fit the new mirrorless Canon EOS R and EOS RP full-frame mirrorless cameras. For many people, unless they've got a couple of grand to spend on the RF 50mm f/1.2, this lens will be their first introduction to Canon's vision of the mirrorless future. Don’t be thrown off by its kit status or the moderate f/4 aperture, though; the RF 24-105mm f/4L IS USM definitively earns its red ring with impressive sharpness and responsive autofocus, combined with a focal range to suit most scenarios. Compensating for the EOS R’s lack of in-body image stabilisation, the RF 24-105mm f/4L IS USM offers five stops of in-lens stabilisation, which comes in very handy given the reach and smaller aperture. The lens performed well in our lab testing, proving impressively sharp at all focal lengths and staying so up to f/11. The new Nikon Z 24-70mm is the lens to beat for centre sharpness, but this comes close for edge sharpness. Fringing at either end of the focal range is apparent in the frame edges, but is by no means distracting. Stick to more middling focal lengths and aberrations are well-controlled, especially so at 70mm. We analyse lens distortion with in-camera correction disabled, where consequently the RF 24-105mm f/4L IS USM exhibits minor barrel distortion at 24mm, transitioning to a similar degree of pincushion at 50mm and beyond. Like the RF 50mm f/1.2 it boasts weather sealing, cementing this as an all-purpose performer that’s an ideal complement to the body. The new Control ring is a signature feature of every Canon RF lens, offering a new degree of customisation. It can be programmed to control ISO, aperture, shutter or white balance. If you're worried about errantly turning the wrong ring, it can be set to only adjust these settings when you depress the Meter button. Videographers were excited about the potential of assigning the Control ring to change aperture, giving them fingertip control akin to traditional cine lenses. Unfortunately, like the Canon RF 50mm f/1.2L the ring can't be de-clicked. While some were concerned that adding a third ring to the lens barrel would complicate use, Canon has thoughtfully designed the barrel to make every input feel distinct. The zoom ring is immediately behind manual focus, but is tapered so that your fingertips don't confuse the two. And in addition to sitting at the front of the lens, the Control ring has diamond-shaped tread so that you can't mistake it for anything else. Even wide open the RF 24-105mm is impressively sharp at all focal lengths and stays so up to f/11. The new Nikon Z 24-70mm is still the lens to beat for centre sharpness, but the Canon comes close for edge sharpness, despite its larger focal range. Fringing at either end of the focal range is apparent at the edge of frame, but is by no means distracting. Stick to more middling focal lengths and abberations are well controlled, and especially so at 70mm. We analyse lens distortion with all in-camera correction disabled to fully expose optical weaknesses. Consequently the lens does exhibit minor barrel distortion at 24mm, transitioning quickly to a similar degree of pincushion pinching at 50mm and beyond. Compact and relatively lightweight, this lens is sharp across the board and its autofocus doesn’t let you down. Despite its designation as a kit lens, the RF 24-105mm f/4L IS USM delivers great performance and makes a compelling tag team with the EOS R.
Far from a three-ring circus, the new Control ring is perfectly at home on the barrel and enables you to adjust every aspect of your exposure without taking your eye away from the viewfinder. It's certainly not cheap for a zoom lens, especially when there are so many existing EF options that work so seamlessly with the new system. That aside, it's an ideal and impressive general-purpose lens that's tailor made for the strengths – as well as the IBIS weakness – of the EOS R body.